Diamond Platnumz was in the past accused of cheating on Zari with his Salome video vixen identified as Hamisa Mobetto. Mobetto who also doubles up as a model has given birth to a boy whom many think could be Diamond’s child. In past interviews, the two have shut down the rumours. But that is not the point. Diamond Platnumz’s mother has been unwittingly fueling the rumours. From admitting that Hamisa’s son is her grandchild in a phone interview with a Tanzanian site to visiting her in hospital. Sanura Sandra Kassim, her real name, was spotted as she went to pay a visit to her son’s alleged side-chick. Minutes later, Diamond’s sister arrived with gifts as she headed in to see the new born. 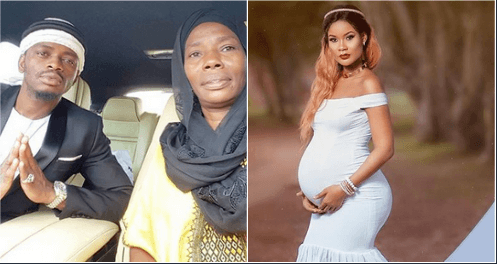 We all know that Zari and Hamisa have never been friends, but Diamond’s family went to see his alleged other lover’s child. Aren’t they just confirming the rumours? It will be remembered that Zari found earings that were not hers in Diamond’s bedroom. She posted them on Snapchat and told ‘The one who left her cheap earings to come for them.’ Coincidentally, Hamisa had been seen with such earings in the past. When asked, Diamond said they could have been left behind when the two were shooting the Salome video. But the question is, did they shoot the video in Diamond’s house? No. And can Zari have been going at Hamisa for no reason?